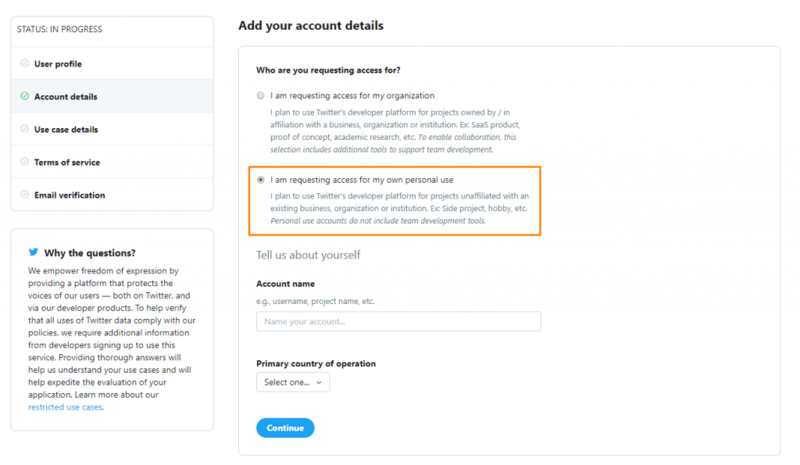 This article is a step by step breakdown on how you can enable Twitter login for returning customers to your company. To make sure that it appears to your customers on your website. 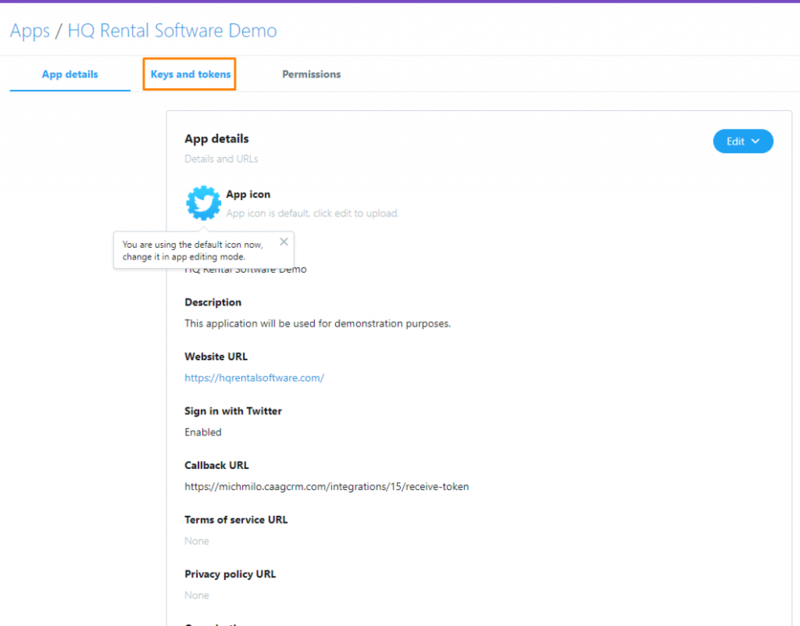 Enable the setting by heading to Settings > Car Rental > Car Rental > Enable Social Login > Yes like in the picture below. 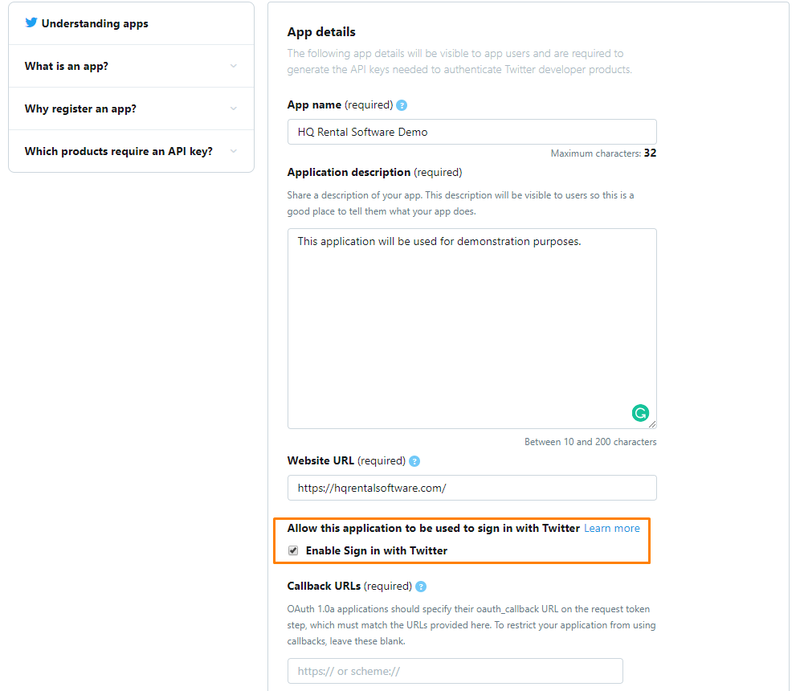 Firstly, navigate to https://developer.twitter.com/ and click the Apply button located on the top right of the page highlighted in orange in the picture below. 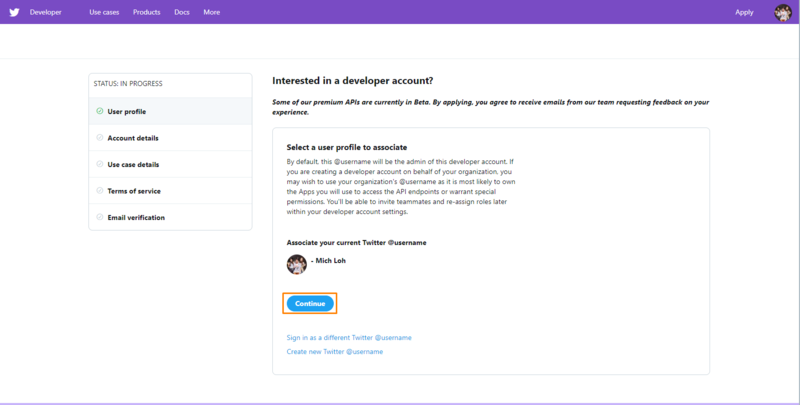 Next, click on the purple “Apply for a developer account” button highlighted in orange in the picture below. After you have clicked on the button, you will be prompted to log in with your Twitter credentials. If you do not have a Twitter account, click on the blue “Sign up now” button. In this next step, select the user profile that you wish to associate the administration rights with and click the blue “Continue” button highlighted in orange in the picture below. Select the second radio box that says “I am requesting access for my own personal use” as shown highlighted in orange in the picture below. As a result, after you click on that radio box, additional fields will appear. 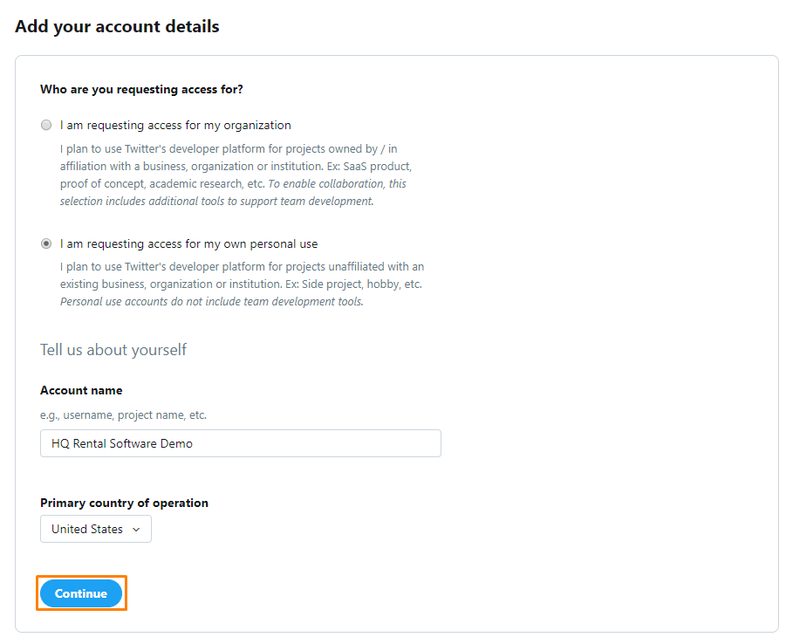 These additional fields are “Account Name” and “Primary country of operation”. Hence, fill up “Account Name” with any name that will be used to determine your account. In the dropdown list for “Primary country of operation”, select where you are located. Click on the blue “Continue” button, highlighted in orange in the picture below after you have finished. In this next step, there are three fields that you would need to fill up to continue. For the first section, select “Consumer / End-user experience” and “Engagement and customer service”. Secondly, answer the questions 1-4 that you see. In conclusion, this integration will only need to retrieve your customer’s Username/User ID and their publicly available information so that the system recognizes them. Lastly, click “No” because our integration will not make information available to a government entity. Click on the blue “Continue” button highlighted in orange in the picture below to proceed. 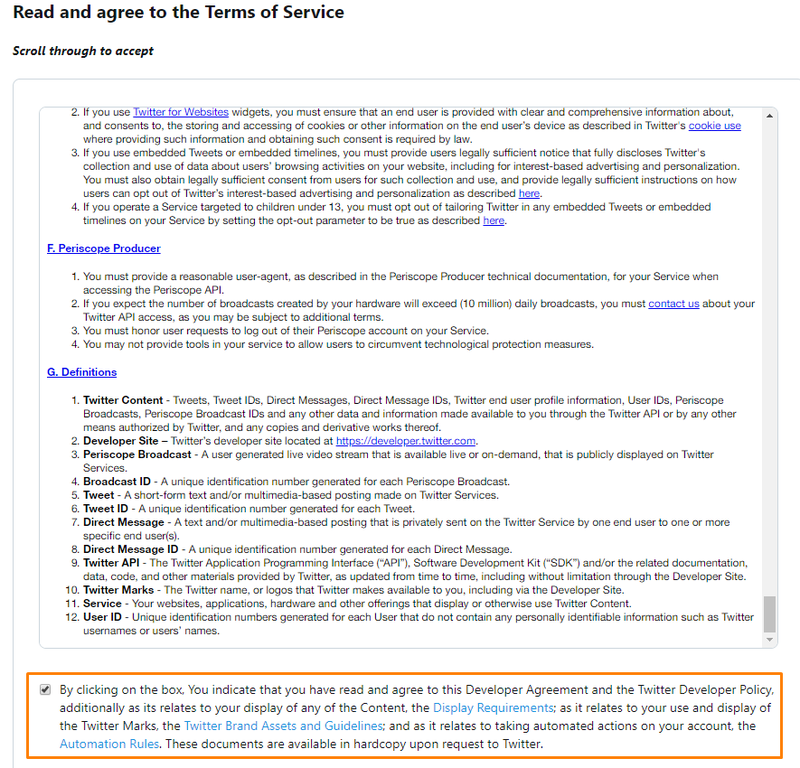 Read through the Terms of Service agreement and then consequently check the checkbox highlighted in orange in the picture below. 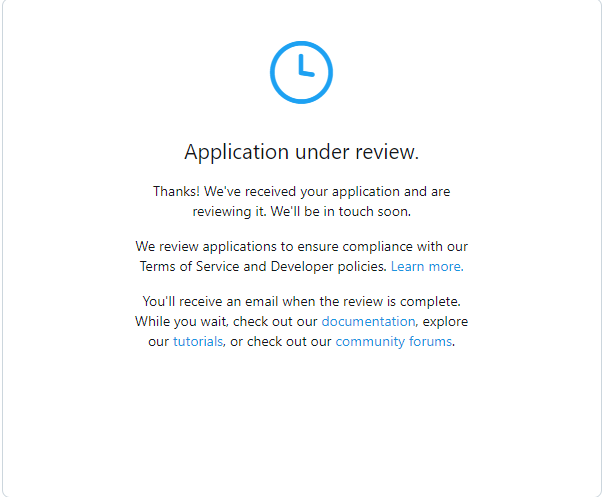 Next, click on the blue “Submit Application” button highlighted in orange in the picture below. 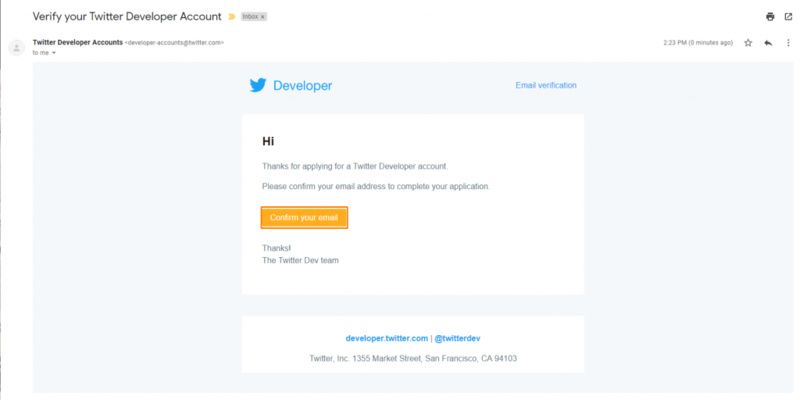 In the email that you use for your twitter account, you should receive an email with the subject “Verify your Twitter Developer Account”. In that particular email, click on the yellow “Confirm your Email” button highlighted in orange in the picture below. When you click on that button, it will open up a new tab that will look something like this in the picture below. 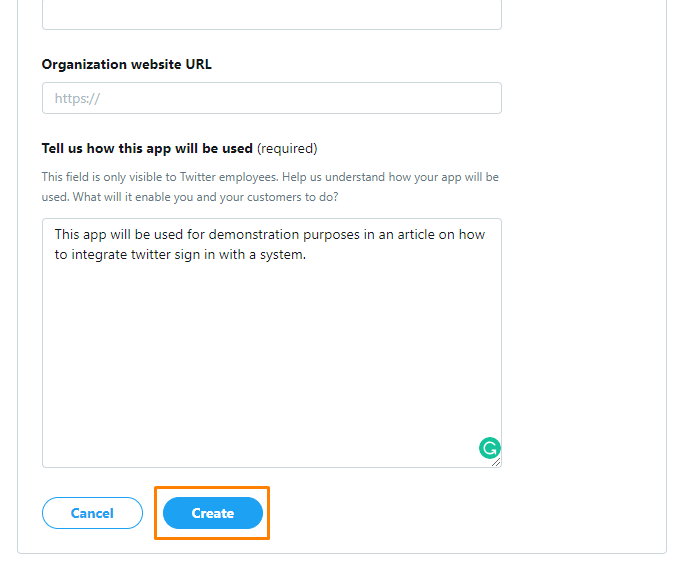 It might take a while before your account is approved by Twitter, therefore, continue to Step 9 once your account has been approved. Navigate to the top right of the page under your username and click on “Apps”, which is highlighted in orange in the picture below. Once you have done so, you will be redirected to the page you see below. Here, click on the blue “Create an app” button highlighted in orange. In this next step, fill up all the required information about the new application you are creating. In this case, stick to the lines of the application being used to help your customers better. 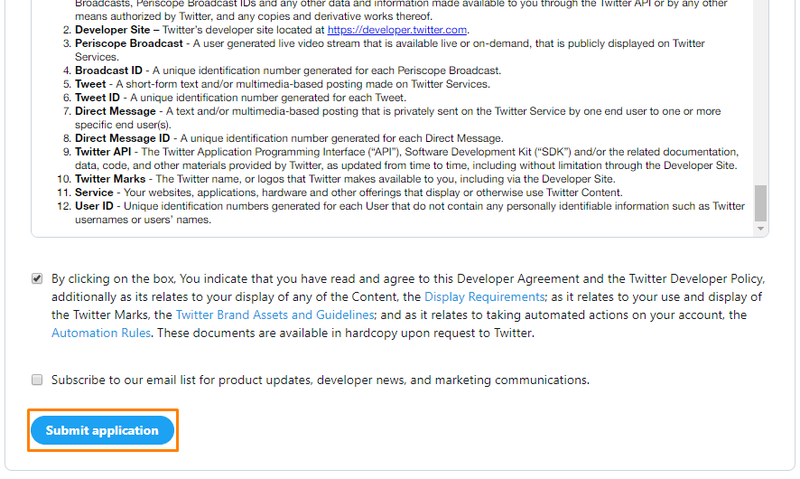 Check the checkbox that says “Enable sign in with twitter” highlighted in orange in the picture below. When you do that, you will notice that Callback URLs is now a required field. Keep note of this field as we will come back to it in a later step. Head to the HQ system and navigate to Settings > Items > Integrations. Here, click on the blue “Add Integration” in the top right of the page, highlighted in orange in the picture below. Next, select “Social Networks” under “Provider Type” and select “Twitter” under “Provider” as shown in the picture below. Do not worry about “Client ID” and “Client Secret” for now, we will get to it in a later step. Click on the blue “Save” button highlighted in orange in the picture below. Navigate back to the integration that you just created as shown highlighted in orange in the picture below. After you click on the integration, you will be redirected back to the page. Here you will notice an additional field called “Redirect URI” highlighted in orange in the picture below. Copy and paste the link under “Redirect URI” into the “Callback URLs” in Step 11. After you have copied the link into “Callback URLs”, you will now be able to click the blue “Create” button at the bottom of the screen, highlighted in orange in the picture below. 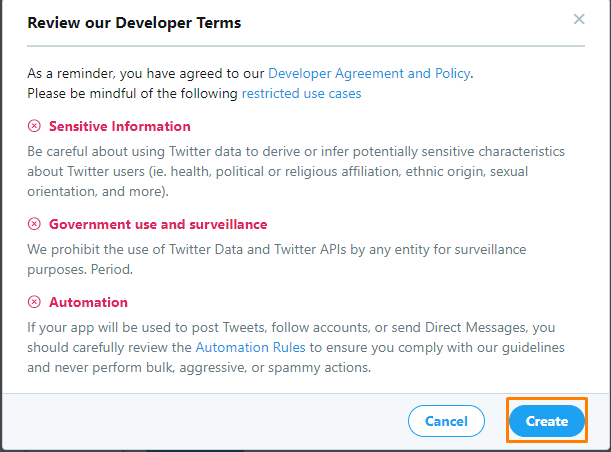 After you have click on the blue “Create” button, a window will appear about Twitter’s Developer Terms. 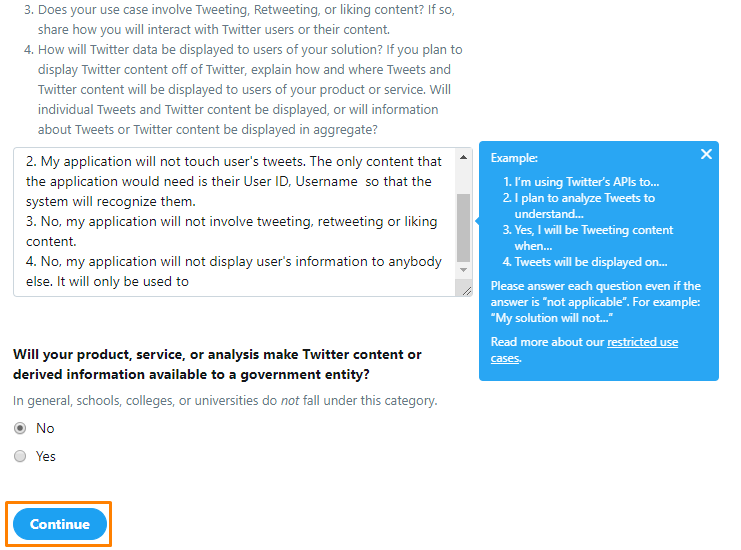 Read through the terms and condition and click on the blue “Create” button highlighted in orange in the picture below. After it redirects you to a new page, click on the “Keys and tokens” tab highlighted in orange in the picture below. Here, copy and paste “API key” and “API secret key” under “Consumer API” into “Client ID” and “Client Secret” in the HQ system respectively as shown in the picture below. After you have done so, make sure that “Active?” is set to Yes and then click on the blue “Save” button as shown in the picture below highlighted in orange. Lastly, navigate back to the same integration and click on the green “Authenticate” button as shown in the picture below highlighted in orange. If you have done all the steps above correctly, you should see something as shown in the picture below. To learn how to set up with Facebook, click here. For Google, click here and for Email click here.